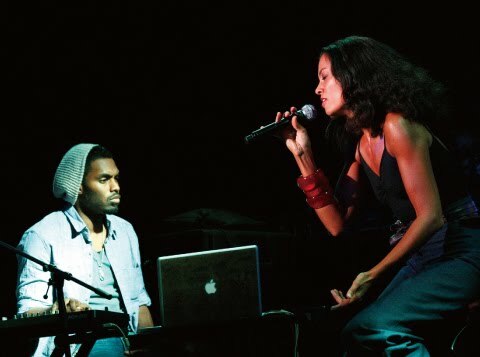 The website Hello Beautiful recently interviewed soul songstress Amel Larrieux in New York City at a performance at the club S.O.B.'s. She, like many contemporary independent artists who sing the music that is unaffectionately known as Neo-Soul, doesn't particularly like that label. We couldn't agree with her, Corrine Bailey Rae, and others more. You might as well say Neo-Soul means no radio airplay. Amel also talks about her daughters joining her group and the upcoming reunion album for "Groove Theory" with Bryce Wilson. Has it really been 15 years since their hit "Tell Me"? Amel Larrieux is one of the best kept secrets in music despite a loyal following around the country. Larrieux cites Ella Fitzgerald, Prince, Rickie Lee Jones, Stevie Wonder, Shawn Colvin, Chaka Khan, John Lennon, Patrice Rushen, Jimi Hendrix, and Joni Mitchell as her musical influences. Although in the video for her 2005 release "For Real", her styling evokes the memory of Minnie Riperton. It's one of the best ballads of the last decade, however not many heard it on the radio outside of KJLH in Los Angeles. It seems that if you don't make the Clear Channel's "Today's R&B and Classic Soul" hit list, others follow suit and you just don't get heard on urban radio.